MySalaryCalculator is no more. 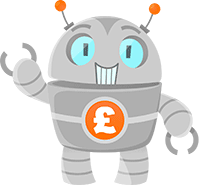 Introducing SalaryBot..
After over a year of developing and marketing MySalaryCalculator, late last Sunday I decided to go back to the drawing board and relaunch with SalaryBot. It was a tough decision, but in the end, one that has been made for all the right reasons. MySalaryCalculator.co.uk peaked in August 2012 and unfortunately has never quite reached the same levels of website traffic ever since. The Android and iPhone apps however have continued their success, with the Android version becoming one of the top 100 free finance apps on the Google Play store. In fact, this whole rebrand can be attributed to Google. Up until late Sept 2012, MySalaryCalculator.co.uk was going from strength to strength. Then that fateful day happened, where website traffic decreased by more than 90% overnight. To this day, I still can’t be 100% sure what happened, but I largely suspect that I was hit by Google’s EMD update. Whilst it ruined search traffic for keywords I was heavily reliant on, it also (more importantly) completely ruined my brand. People searching for “My Salary Calculator” couldn’t find it, and that to me was the deal breaker. 1) The name sucked. It’s such a mouthful, and quite easy to forget. 2) The brand itself wasn’t unique. From a crowd of very similar products, nothing stood out that would really make you remember it. Upon reflection, it was really a no brainer to give it another go with SalaryBot. I’m happy to announce that the website was successfully relaunched last Sunday, the apps are about to be rebranded and that there’ll be some new features arriving soon to all platforms (I promise!). This entry was posted in Salary calculators and tagged my salary calculator, mysalarycalculator, rebrand, salarybot by admin. Bookmark the permalink.